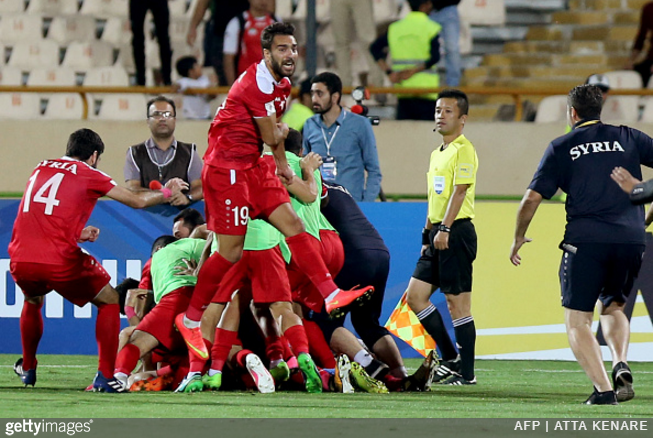 Syria’s utterly inspirational journey toward qualifying for their first ever World Cup was kept alive in the most dramatic of circumstances on Tuesday evening. Trailing 2-1 against rivals Iran as injury time wicked away, it looked for all the world like the dream was over. However, Syria suddenly wrestled back possession and, on his first call-up in five years, Omar al-Soma broke clear on the break to slot a 93rd-minute equaliser through the legs of Iran ‘keeper Ali Beiranvand. Cue pandemonium. The second goal! The second goal for our national team! Who scored it? Who scored? Somah! It had to be Somah! It had to be Somah! The equalizing goal! Pardon me! I’ve lost it! No one can stop them! The 2-2 draw means that Syria will now play a two-legged play-off against Australia, the winner of which will go into a secondary ‘inter-confederation’ play-off against the team that finishes fourth in the CONCACAF qualifying pool (likely to be the United States, Panama or Honduras), the winner of which will earn themselves a spot at Russia 2018. It’s certainly a big ask, but Syria have already proved that they’re capable of near-miracles. Wow, this is as touching as it could possibly get! I’d love to see them qualify and make their people proud and happy for a little while, after all the mayhem they’ve all gone through.